Ohhh, what a beautiful and busy week! I need to take my own advice sometimes, because the schedule has been crrraaazzzyyy... In a good way that requires little doses of "chill" in the afternoons, and not getting on the computer much. When I was a kid and teenager, I generally thought that if people were wearing shorts in San Francisco, they weren't from around here... clearly tourists, you know? In 2013, I think I've worn shorts more than any year in my memory. It has been SO.NICE.OUT. It's scheduled to be 70's & 80's again this week, which- as my husband says- pretty much guarantees that when my in-laws come to town the following week, it'll be 50's & 60's again. ;) Hopefully we're setting ourselves up to be wrong on that one. 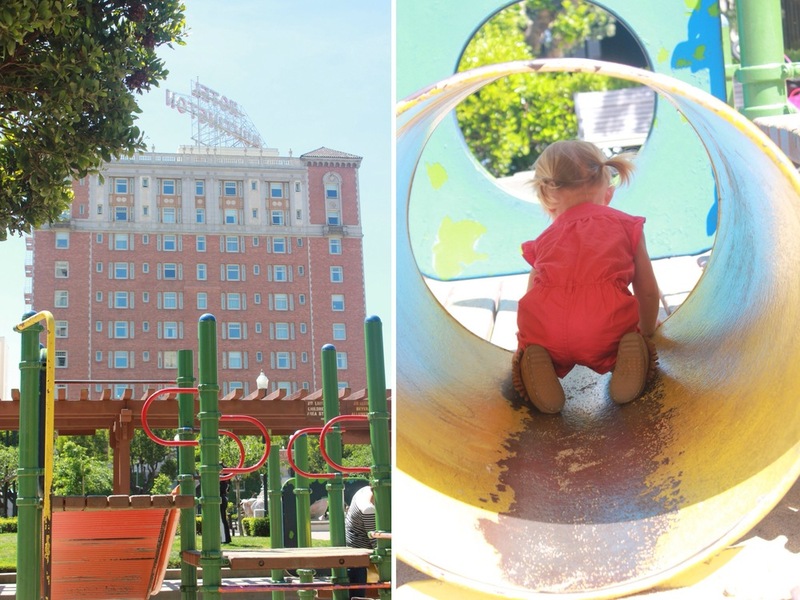 Today we took a long adventure to Huntington Park in Nob Hill. It was just supposed to be a little Tuesday bus ride to a new-to-us park, maybe a slice of pizza in the area, then a ride home, but the girls and I weren't done with our adventure after the park... actually Maggie was (she fell asleep almost immediately), but Sophie & I still had a bit of energy and wanted to keep exploring. So we did. More about the exploring on Friday... today, just a little bit about the park. So here's my take: the REALLY good things about it were that it was surrounded by gorgeous buildings, is in a totally prime area for visitors and tourists- (but strangely was almost all locals- prob because tourist season hasn't quite started), had tons of bench space, and the structures had like a 70's Sesame street vibe. The colors, the treacherous gaps between stairs... that sort of thing were not quite as ideal, and there wasn't a fence around the playground, which always docks a couple points for me. All in all, we liked it, but Sophie says she likes "the other new park better even though this one is pretty good." Spoken like a diplomatic professional, right? 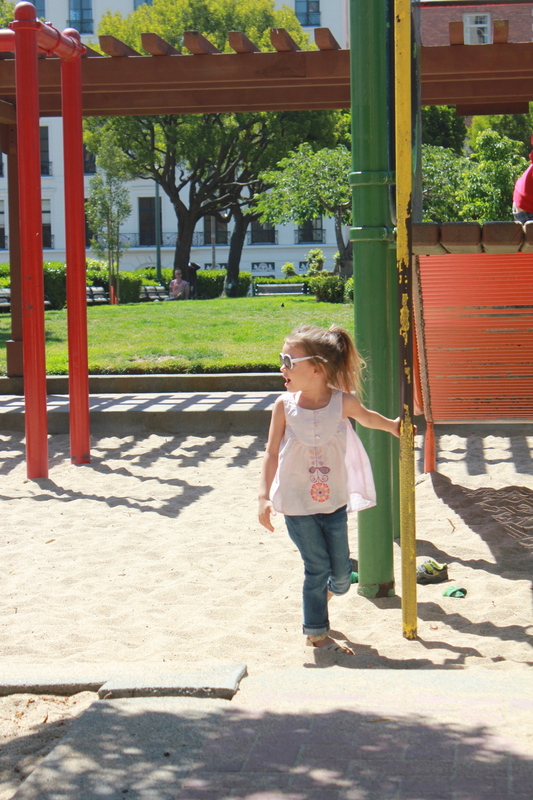 Anyway, we're going to try to hit up new parks around the city once every week because a) it's fun and b) we'll always know the best spots for kids to play! On another note, thanks SO much to Tea Collection for Sophie's perfect shirt. It twirls like a princess dress but can be paired with the practicality of a pair of jeans (her Gap ones are my favorite!) for playing, so everyone wins. There's this stigma on Tuesdays around here, because they're not Monday where you get caught up on everything, but they're still so far from the weekend, so they really have nothing going for them... Today, I realized that maybe Tuesdays don't have to be so bad after all... right? Tea Collection provided Sophie's tank for review, but all opinons are my own.